Featured Series – Spotify: Discover Weekly and Release Radar. Spotify has built much of its brand on machine learning and algorithms, employing the former and the latter in a number of different contexts. (This much is evident in the company’s aggressive acquisition strategy, having most notably acquired… wait for it… MightyTV, Mediachain Labs, The Echo Nest, Niland, and Sonalytic – all of which are music-focused machine learning- and/or AI-based start-ups.) But by far Spotify’s greatest algorithmic success story has been Discover Weekly, as well as its more recent off-shoot, Release Radar. As of May 2016, Spotify’s Discover Weekly – the idea for which surfaced around mid-to-late 2013 – boasted over 40 million listeners, a number that has surely been dwarfed in 2017. Most staggeringly, at the time of the above announcement, Spotify mentioned that more than half of the playlist’s listeners: (1) returned to the playlist the following week; (2) listened to at least 10 of its tracks each week; and (3) went on to save at least one of them. Discover Weekly at its most simplest, and per Spotify’s own description, is “a weekly mixtape of fresh music.” In essence, this playlist is created by an algorithm programmed by Edward Newett, an Engineering Manager with the company, which creates a completely unique playlist of new music for each of Spotify’s some 140 million active users. The playlist is refreshed on a weekly basis. Discover Weekly builds a so-called taste profile for a particular user based on their past listening history and, in examining similar songs that said user has not yet listened to, curates a personalized weekly playlist aimed at finding them their next favourite song. More precisely, the algorithm assesses the songs which appear on other users’ playlists and that closely resemble a user’s previously saved tracks – an indication of fondness above simple listening history – in order to predict the ones it should pick for Discover Weekly. 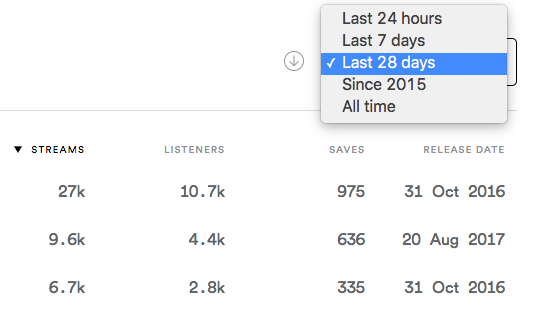 High and sustained stream counts, generally, as well as significantly more streams than listeners (i.e., an indication of listeners that are streaming a song multiple times). One can glean valuable insights on fan engagement from Spotify’s stats. While this is all great news for music listeners who are looking for an automatically well-curated library of likeable tunes, this isn’t the last page in Spotify’s book of machine learning tricks. Spotify’s Release Radar takes machine-curated music to the next level with the power of Echo Nest – technology it acquired back in 2014. In Release Radar, Spotify’s talented team of techies have built an algorithm that keeps you up to date on the latest content released by your favourite artists. Whereas Discover Weekly is focused on music discovery from artists with which you’re probably not familiar, Release Radar is essentially a weekly recap of all the new music from the artists whose tunes you’ve already saved or listened to, along with a few totally new songs that you might like which are thrown into the mix. As with Discover Weekly, the Release Radar program leverages your listening history data and references it against certain genres, personal tastes, other user data, and millions of complex, intertwining connections between the metadata of the music you are listening to. The most interesting note here, however, is the way in which Release Radar makes use of the acoustics of the music you are listening to. Since the output of the algorithm is content that is relatively new, the algorithm cannot rely purely on user data, and instead opts to make use of the complex data embedded in the very timbers, tempos, and sounds of the newly released tracks. 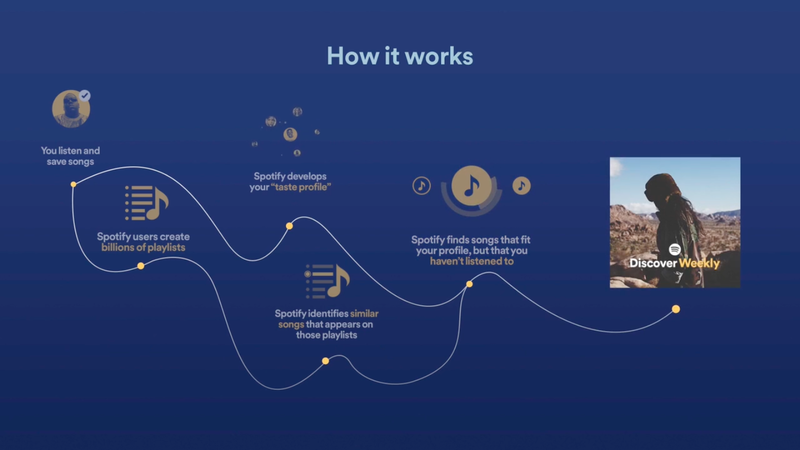 This allows Spotify to deliver intelligent curation of content, even in the absence of user data, thus resulting in music recommendations that are as accurate as technology currently allows for – by combing through literally every piece of the music. The above advice applies here, too. In addition, as a general note, songs that capture attention right off the bat, and which thus have low skip rates, are more likely to be added to, and perform well in, playlists. Other than that, it’s just a matter of making music that is well-liked. There is no one particular genre or mood or tempo that is better than another – if people like it, Spotify will make sure that it gets heard. This article is part of our new series which is designed to elucidate the inner workings of the world’s preeminent streaming platform, particularly from the perspective of artists looking to boost their Spotify presence. For more opinion pieces and informational content on music marketing, head over to the Producer’s Hub.